A new grammar for both absolute beginners and students who already have a sound knowledge of the language but need to revise and enhance it. The publication of this book may raise this question: Is it a grammar or a textbook? The answer is very simple: it is a grammar, as the title says. It is not supposed to be a textbook like for instance Athenaze, Reading Greek, From Alpha to Omega, etc. The question has arisen from the fact that it is written in a peculiar way, as if talking to the student, and the explanation is really simple: some years ago, during my period teaching Greek and Latin at the University of Oxford (2003-2007), I conceived the idea of writing two new language courses, one for Greek and one for Latin, but further ahead I decided to write a grammar for each language rather than a textbook. Nevertheless, as I still had that "language course" idea, I have ended up writing a grammar that may have some kind of "teaching flavour" in the way it is explained. I would define it as a grammar explained as if it were a course textbook. subdivisions in each of these blocks for a completely clear presentation. • BASIC VOCABULARY: List of the most useful terms that follow a given scheme after it has been presented: nouns, adjectives, verbs, etc. sentences taken from classical authors for more advanced students. • APPENDICES: Covering the basic rules for accentuation, the characteristics of Homeric dialect and the dual, all of them with examples. uses of participles, etc. ), alphabetically presented at the end of the book. 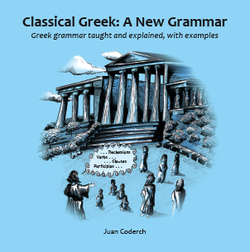 • INDEX OF GREEK GRAMMATICAL WORDS: Lists all Greek words used in presenting and explaining grammatical functions and usage. The printed book is available ONLY through Amazon at a low price, but you can download it as a pdf here for free. Please observe the usual terms that accompany any Creative Commons Attribution-Noncommercial-Share Alike 3.0 License, which means, among other things, that you may not attribute this work or part of it to another author and that you may not use it for commercial purposes.